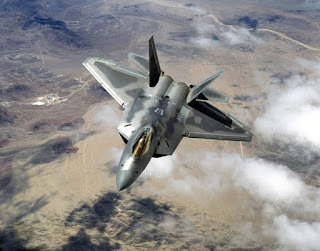 Lockheed Martin/Boeing's F22 raptor is a fifth generation fighter aircraft and uses stealth technology. Which is used in electronic warfare, ground attacks, signal intelligence etc. Lockheed Martin is the prime contractor along with Boeing Integrated Defence Systems. F22 raptor also won the Collier trophy(This trophy is for greatest achievements in aeronotics or astronotics in US) in 2006. This fighter aircraft is not for sale to other countries and its unit cost forced the US government to consider the closing of production systems. This is one of the most advanced aircraft ever built in the aviation history as Air Chief Marshal Angus Houston said. But look at India's situation even now we are buying the aircraft from foreign countries. And ofcourse the expenditure for these aircrafts will be very high. In another manner we are simply buying the aircraft and giving the money to them. Even if there are many joint ventures and technology transfers occur in the course of time its high time for India to aggressively move towards indegenious production. It should not be compulsory that only Government Companies will get these prestigious contracts. Allow private companies to come in. In US and in many European countries aircrafts are not only built by Government undertakings but by private companies like Lockheed Martin, Boeing Integrated Defence Systems, Dessault Aviation, General Dynamics etc. Government can have some stakes in these companies. The recent decision by Indian Government to introduce private companies in Indian defence sector may improve the situation. It also generate more jobs and huge investments in defence sector. The another important thing is that the selling of these aircrafts to other countries will generate huge profits. Remember that whatever happened o world economy no country is going to cut short their defence expenditure. In these times when our neighbours like China are moving fast forward in the defence sector its high time for us to improve our capabilities.